Emphasis is on the whole child: physical, emotional, intellectual, and linguistic. 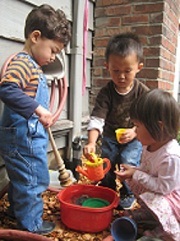 Young children learn by doing, by actively working with things in their environment, using all their senses. Development of language is crucial at preschool age, both as vehicle for self-expression and communication, and as the foundation for later work in the language arts. Creativity is experienced through painting, drawing, building, music, movement, dramatic play, and story-telling. Their initiative and self-motivation is encouraged by much individual choice of activities. In cooperative play, they teach and learn from each other. Those who show readiness for work at the symbolic level are given direction in reading, writing, and computation, but academics alone are not stressed. At Central Branch, we embrace the diversity of the school families and the community and this value is reflected in books, pictures, and other curriculum materials. Classes meet in their own rooms, with access to shared indoor and outdoor spaces for active play. Children visit between groups occasionally and classes often join each other for outdoor activities. The program includes large and small muscle activities, and a balance of quiet and noisy play, indoor and outdoor pursuits, individualized free play as well as small group interaction. Central Branch believes that play is serious business for children. It is their way of rehearsing the connections that will make life meaningful: links between feelings and language, between themselves and others who may look or act quite different. The teachers’ training and experience in early childhood education provides them with a thorough understanding of child development in an unselfconscious environment of freedom and respect between adults and children. The school enrolls 2-year-olds in 2-day morning classes. The ratio of students to teachers in these classes is 7 to 1. Older children may attend either 5-day morning or afternoon classes.The student-to-teacher ratio for these classes is 9 to 1. The school offers some extended hours before and after regular class times for some families. Central Branch also offer a mixed-age afternoon program. This class includes the same kind of learning experiences offered in morning classes. Traditionally, classes have had as narrow an age spread as possible. However, the advantages of more mixed groups are weighed and such placements may be more appropriate during some school years. We use a variety of tools to identify and record growth of your child. Through observation, interaction, classroom activities and work, and the High Scope COR Observation Record, we document the development of your child throughout the year. Your input is important and integral to this process. It helps us to identify the growth that is taking place as your child plays, tries out new ideas, solves problems and makes new friends. In addition to two parent-teacher conferences, families will receive an end-of-year letter highlighting this amazing growth. The school’s behavioral expectations are based on an understanding of child development and individual differences between children. Limits are clear and there are as few “no’s” and “don’ts” as possible. Children are taught that they may not be destructive of materials or toys, or do what is dangerous to themselves, or is physically or emotionally damaging to others. The staff models and positively reinforces the kinds of behaviors we wish children to learn. Teachers work closely with each other and with parents to ensure consistent expectation between home and school.